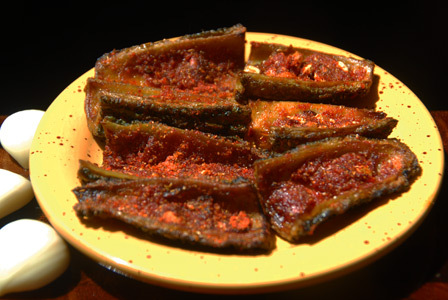 Bitter gourd is slightly scraped and deep fried in oil till golden brown in color. It is the layered with fresh mix of powdered spices. Serve masala deep fried bitter gourd with steamed rice and dollop of ghee. Makes: around 4 Servings of Masala Deep Fried Bittergourd. Peel and grate the garlic cloves onto a bowl. Stir in coriander powder, cumin powder, turmeric powder, red chili powder and salt into grated garlic bowl. Slightly scrape, wash and remove little bit of both ends of the bitter gourd. Cut the bitter gourd into halves vertically. If the bitter gourd is long, halve the slices horizontally. Heat oil in a pan on medium heat for deep frying. Carefully add the quartered bitter gourds and deep fry till the bitter gourd turns golden in color. Remove the deep fried bitter gourd onto absorbent paper. Once warm enough to handle, layer few pinches of the garlic masala powder on the deep fried bitter gourd. Repeat the same with any remaining bitter gourd pieces. Serve masala deep fried bitter gourd with steamed rice and dollop of ghee. Notes: Make sure oil doesn’t get too hot while deep frying bitter gourd. Suggestions: Adjust spice with red chili powder. If desired, discard few of the bitter gourd seeds before deep frying. Variations: Check other variations of bitter gourd like moong stuffed bitter gourd here. Other Names: Masala Deep Fried Bittergourd. Spicy and tempting recipe.. looks awesome !! Hi, i like trying some of the recipes and they do turn out good.I want to know as to what is farsan?